GERMAN manufacturer of designer bathrooms Duravit has unveiled a new shower-toilet generation in two versions which impress with their pared-down aesthetics, timeless modernity and enhanced comfort. The two models – SensoWash Starck f Plus and SensoWash Starck f Lite, designed by Philippe Starck – feature a minimalist design for maximum shower-toilet comfort and are convenient to operate via a remote control, freely configurable via an app. The innovative remote control with its flat, elegant design feels pleasant in the hand and all functions are controlled intuitively. It incorporates a motion sensor for automatic cover opening, and offers a wide range of setting options for seat heating, shower flow, and the controllable hot air dryer. 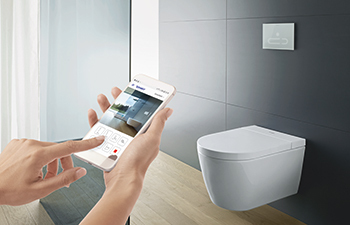 The associated SensoWash app enables individual configuration of the shower-toilet, or it can be optionally controlled in the standard way with a remote control. The flush function and odour extraction system may also be controlled via remote control or app if the wall-mounted element is combined with the A2 electronic actuator plate. “Thanks to the new Rimless technology and an optimised basin and siphon geometry, SensoWash Starck f provides improved water flow for perfect flushing results. HygieneGlaze 2.0, which kills 99.999 per cent of bacteria in a relatively short time, guarantees an optimum hygiene standard,” the spokesman adds. ONLINE lighting specialist tableLights.me has expanded its extensive collection of decorative lighting with the launch of designer brand Sirius. The Danish brand develops indoor and outdoor lighting in collaboration with Scandinavian designers. Each design is rooted in the Nordic style and culture, with simplicity, ambiance, and clean lines in mind. The Sirius collection includes LED candles, decorative table lights and string festival lights. tableLights.me, is a member of Desert River, a Dubai-based high-end trading firm for furniture, lighting and events rentals and the official distributor of well-known European furniture and lighting brands. VIGANÒ & C’s new upholstered armchair Milly is the first in a series of products that express its new concept of “silent innovation”. Designed in collaboration with Basaglia Rota Nodari Studio, Milly’s curved and elegant shapes refines the classic lines of the tub armchair. The structure in steel rod is stable and light – thanks to the two parallel semicircles – and available in chrome or powder-coated versions, says a spokesman for the Italian manufacturer. “The anterior semicircle has been studied to facilitate the freedom of the movement. But the innovative solutions go further, like the backrest that tapers upwards, with a curvature that guarantees a manageable and more relaxing seat,” he says. Over 100 fabrics, colours and finishes make Milly a crossover seat, able to fit easily into any office environment and into contemporary living. Milly will be expanded with two versions: one with wooden legs and the other with a swivel structure, as precursors to a large family of armchairs, ottomans and sofas, characterised by modularity. “Behind every chair Viganò & C there are people who have dedicated time and resources to solve every minimal aesthetic and functional detail. At Viganò & C, the research on materials never stops. The selection covers the best materials available in the market,” he remarks.